Liver pain can originate from several areas involving the liver. Many diseases of the liver cause swelling of the liver itself leading to stretching of the liver capsule. This pain is often described as dull and located in the mid-epigastric area. The diaphragm may also be irritated in this situation. Diaphragmatic irritation may cause pain radiating to the shoulder. Irritation of the lining of the abdomen (peritoneum) or the lining of the chest wall (pleura) can cause pain that is described as sharp and worsening with respiration. 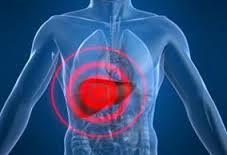 Hepatitis or inflammation of the liver, which can be caused by viruses or alcohol abuse. Fatty liver, or steatosis, the accumulation of large amounts of fat in the liver. Fatty liver may be caused by alcohol abuse, or by obesity or metabolic syndrome. Damage caused by toxins or drugs. Liver cancer. Cancer may originate in the liver as a result of cirrhosis, viral infections, or chronic alchol abuse, or it may occur when cancer elsewhere metastasizes (relocates) to the liver. Cirrhosis of the liver, or replacement of much of the liver by scar tissue; this can be a long-term result of viral infections (such as hepatitis B and C) or alcohol abuse. Rare inherited disorders, such as hemochromatosis and Wilson’s disease, which can cause hepatitis, cirrhosis and eventually liver failure. Testing involves identifying the cause of the liver pain. This may include blood tests, CT scans or MRI. Once the cause of the problem is identified, then treatment can be based on the diagnosis. Treatment of liver pain is mainly based on treating the underlying cause of the problem. Since the liver is responsible for metabolizing medications, abnormalities in liver function may limit the type of dose of medications that are allowed. Other causes of pain which do not involve the liver but cause similar symptoms must be excluded. This include pain from cardiac causes, gall bladder and gastrointestinal problems.